Webb, 31, is coming off a rough and abbreviated season with the Rays, in which he pitched just 17 1/3 innings with a 5.19 earned run average. That represented Webb’s lightest big league workload in any season since he made his Major League debut with the Padres back in 2009. Prior to that disappointing campaign in Tampa Bay, though, Webb had logged a career 3.35 ERA in 376 innings with the Padres, Marlins, Orioles and Indians. Webb isn’t an overpowering arm by any means; he averaged 92 mph on his heater in 2014-15 and sat at 90.9 mph in last year’s limited sample. Beyond that, he’s averaged just 6.2 strikeouts per nine innings pitched in his Major League career. However, Webb’s control has continually improved since his rookie season. Over the past three years he’s issued only 27 walks (five of them intentional) in 117 1/3 innings of work. Beyond that, Webb boasts a strong 56.1 percent ground-ball rate in his career and has routinely posted lower hard-contact rates than that of the league-average reliever. The bullpen was a significant question mark for the Giants in 2016 and has already taken a notable hit in 2017 with the loss of southpaw Will Smith to Tommy John surgery. While signing Webb obviously won’t be construed as any kind of marquee addition, it’s also nice for San Francisco to have a depth option that comes with plenty of Major League success under his belt. The Giants currently have Mark Melancon, Hunter Strickland, Derek Law, George Kontos, Cory Gearrin and Neil Ramirez as right-handers in their bullpen, plus Ty Blach on hand as a southpaw option. Behind that group, right-handers Albert Suarez, Dan Slania and Chase Johnson all represent 40-man options for the Giants. The White Sox have released right-hander Ryan Webb, Baseball America’s Matt Eddy reports. The 30-year-old reliever signed a minor league deal with Chicago in July after being released by the Rays earlier this season. Webb signed a one-year, $1MM Major League deal with Tampa in February but wasn’t very effective in his brief stint as a Ray, posting a 5.19 ERA, 5.7 K/9 and 3.67 K/BB rate over 17 1/3 innings. The peripherals numbers weren’t too far removed from Webb’s career marks, and there was certainly some batted-ball misfortune (.417 BABIP) that led to Webb’s inflated ERA. It was certainly a step down from Webb’s usual performance, as the righty had posted a solid 3.35 ERA (with a 6.2 K/9, 2.15 K/BB and 56.5% grounder rate) over 376 innings from 2009-15 for the Padres, Marlins, Orioles and Indians. His 2016 struggles continued at the Triple-A level, however, as Webb tossed only 2 2/3 innings (with a 13.50 ERA) for the top White Sox farm club. He hasn’t pitched since July 20, so there could well be an injury at play, making it even more unlikely that another team would sign Webb for the September stretch run. The White Sox have inked a minor league deal with reliever Ryan Webb, per Dan Hayes of CSN Chicago (Twitter link). The veteran righty will report to Triple-A. Webb, 30, had pitched to a 5.19 ERA over 17 1/3 innings with the Rays before being cut loose. Beneath the surface, though, he has been much the same pitcher as always — a sturdy but hardly dominant middle reliever. Webb is still generating grounders on about half of the balls put in play against him and is near his career marks with 5.7 K/9 against 1.6 BB/9. The biggest problem thus far, it seems, has been a .417 batting average on balls put in play against him — though Webb’s career-worst hard contact rate (32.3%) suggests that may not just be a result of poor fortune. For Chicago, the move adds depth in an area where the team has taken some hits of late. The South Siders are still running out a fairly talented overall relief unit, but have lost several useful arms already in 2016. The Rays have designated right-hander Ryan Webb for assignment, according to Roger Mooney of the Tampa Bay Times (Twitter link). His roster spot will go to previously designated Danny Farquhar, who will return to the big league club after having been sent outright to Triple-A. Webb, 30, inked a one-year deal that guaranteed him a million dollars this offseason with the Rays. He totaled 17 1/3 innings out of the Tampa Bay bullpen and posted an uninspiring 5.19 ERA, though with 11 walks against just a pair of unintentional walks and an above-average 48.4 percent ground-ball rate, there’s plenty of reason to believe that Webb can right the ship and contribute later this season, be it with the Rays or another organization. Webb entered the 2016 season with a lifetime 3.35 ERA, 6.2 K/9 and 2.9 BB/9 in 376 innings at the Major League level. FEB. 19: Webb can earn up to $500K worth of incentives based on appearances, Topkin reports (Twitter link). FEB. 18: The Rays announced to the media today that they have signed right-hander Ryan Webb to a one-year deal, via Marc Topkin of the Tampa Bay Times (Twitter link) and Roger Mooney of the Tampa Tribine (Twitter link). Topkin tweets that Webb is guaranteed $1MM and can earn more via incentives. To clear a spot on the 40-man roster, right-hander Chase Whitley was placed on the 60-day disabled list. Whitley is recovering from Tommy John surgery. 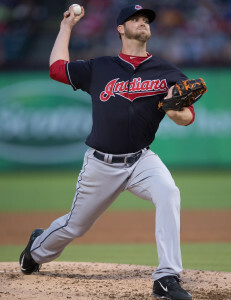 The 30-year-old Webb, a client of the Wasserman Media Group, spent the bulk of 2015 with the Indians, logging a 3.20 ERA with 5.5 K/9, 2.1 BB/9 and a 59.2 percent ground-ball rate in 50 1/3 innings out of the bullpen. Webb was the subject of some rather unique roster shuffling with the Orioles and Dodgers, in which the Dodgers took on the entirety of Webb’s remaining $2.75MM salary in a four-player trade that also netted L.A. a Competitive Balance Draft Pick. The Dodgers outrighted Webb immediately, and Webb, as a player with five-plus years of service time, was able to reject the assignment and still be guaranteed the entirety of his salary. As such, the Dodgers effectively purchased a draft pick from Baltimore through that transaction (as MLBTR’s Charlie Wilmoth examined in greater depth at the time). Despite that curious situation, Webb has been a largely effective reliever over his six years in the Majors. While he doesn’t miss many bats (career 6.2 K/9), Webb has a career 3.35 ERA with reasonable control (2.9 BB/9) and an excellent 56.5 percent ground-ball rate. He’s endured just one stint on the disabled list since debuting in 2009 — a six-week stay for inflammation in his right shoulder back in 2011. Webb hasn’t missed any time since that apparently minor injury, however, and has been a durable arm out of the ’pen, averaging 55 appearances/58 innings per season from 2010-15 with the Padres, Marlins, Orioles and Indians. The Rays certainly have room to add a useful arm like Webb to the relief corps, as the team traded Kevin Jepsen to the Twins last July, traded Jake McGee to the Rockies just last month and outrighted Brandon Gomes off the 40-man roster following the season. That trio accounted for 138 innings of relief for the Rays last season, and Webb will absorb a fair portion of that workload. 7:25pm: The Rays could announce a deal for Webb as soon as tomorrow, writes Topkin in a full column. Moreover, it appears that Webb is in line for a Major League deal with the Rays, as Topkin writes that the the holdup in the deal “could be” related to the determination of a corresponding 40-man roster move (notably, players can officially be added to the 60-day disabled list beginning tomorrow). 12:07pm: The Rays are closing in on a deal with right-handed reliever Ryan Webb, according to Marc Topkin of the Tampa Bay Times (via Twitter). Tampa Bay has been said to be pursuing relief additions in recent weeks, and it seems they’ll likely add at least one new piece as camps open around the game. Webb, 30, contributed 50 2/3 innings of 3.20 ERA pitching to the Indians last year after joining the team on a minor league deal. Though he averaged only 5.5 K/9 against 2.1 BB/9, he generated an excellent 59.2% groundball rate on balls put in play against him. That solid effort came in spite of the fact that Webb was caught up in some early-season transactional machinations that somewhat surprisingly left him without a roster spot. Webb has averaged 58 frames of 3.31 ERA pitching annually since his first full season of MLB action back in 2010.